Castelnau de Montmiral seen from the Vere Valley. By Gordon Frickers 40 x 50 cm (15¾” x 19¾”), both available, can be purchased by instalments, ask for details. The challenge, I have often accepted, was to see what would happen by painting in inclement weather. A pair of experiments, the weather was wet but warm , a typical Midi Pyrenees summer storm. I just had to do something , my alternative being to stay snug indoors so donned my sea coat. Painted on successive days from the same location, Castelnau de Montmiral, painted ‘plien aire’ by a very soggy artist, a summer storm caught in dramatic mood, as painted from beside the Lac de Vere on successive warm days, during and immediately after heavy rain and thunderstorms that peel off the Pyrenees, typical of summer in this beautiful region. 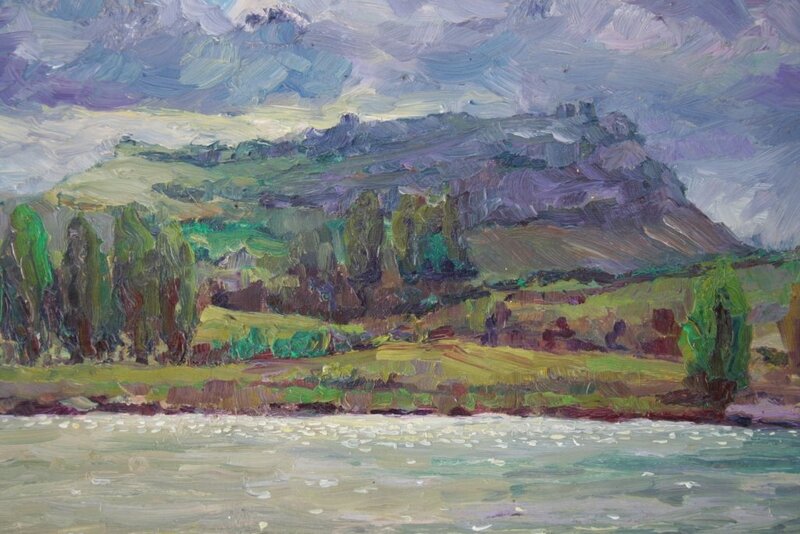 The subject I chose to paint is a 3 km walk down hill passing fields and woodland to the Lac de Vere, from the bastide village of Castelnau de Montmiral. Painted on location, these fine studies measure 40 x 50 cm (15¾” x 19¾”), available, can be purchased by instalments, ask for details. 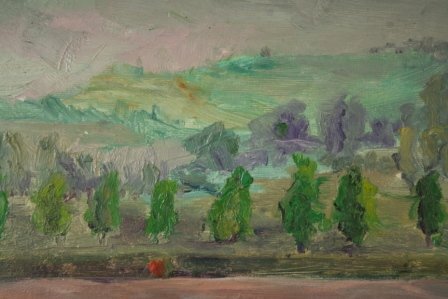 This painting with its extraordinary ambience would make a fine reminder of Midi-Pyrénées, SW France, for a private collection, hotel of restaurant.